Individualized feeding 3 times a day. Feed provided includes 12% or 14% protein sweet feed, (special formula designed for us by “Kentucky Equine Research” after analyzing hay from our area), Front Runner Senior Feed, Front Runner Complete Supplement and quality hay (choices of grassy or grass/alfalfa mix). Other supplements and special feeds are not included but will be fed if provided by boarder. Boarders are welcome to complimentary treat hay at any time. Turnout in 12 grass paddocks/pastures. Choice of turnout in small group, with buddy or individually. All pastures have 3 or 4 rail fencing. Round pen for horses needing limited activity. Blankets, boots, fly masks, fly spray and sheets put on and removed at no extra charge. Turnout is 7 days a week. If weather or pasture conditions warrant that we cannot turn out, your horse will be hand walked or turned out in the indoor arena. Our turnout board will inform you what we did with your horse that day. 4 tack rooms, 2 hot/cold wash stalls, 2 rest rooms, 2 offices, lounge, kitchen/utility room (with refrigerator, microwave, pizza oven) and orderly grain/supplement room. All heated in winter months. Large 80’ x 225’ indoor riding arena with excellent rubber/sand footing and mirrored wall. Full size dressage arena can be set up in the indoor. Enclosed observation room upstairs for viewing and additional clinic auditing. Electronic centrally monitored fire alarm system. 3 outstanding outdoor riding arenas all with great sand/rubber footing. Boarders are welcome to enjoy all of them. The top rings is 252’ x 120’ has 3 rail fencing, sand/rubber footing and is used as an all purpose ring or a warm up ring for competitions. The middle ring is a standard size dressage competition (20 x 60 meters) with Judge’s stand. The ring was made with compacted crushed stone base as recommended by USDF guide UNDER FOOT, then sand/rubber footing was added for great all weather riding. Our boarders and show competitors lover it! The lower ring is 253’ x 113’ with 3 rail fencing. It also has the crushed stone foundation with sand/rubber footing. The ring is used for jumping or as an additional dressage ring when we have competitions. Cross Country Course suitable for pre-beginner novice, beginner novice and novice. New water jump under construction for completion June 2009. 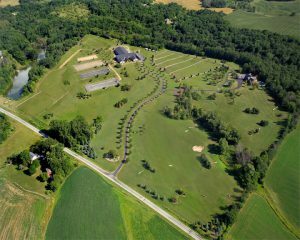 Rolling hills and acreage for you and your horse to do training, trail riding or just enjoy each other. Showing was never so pleasant than to be able to do it on your own home grounds! Boarders enjoy the convenience of showing without having the expense and stress of traveling. Two USEF recognized Dressage Shows, three WDCTA recognized shows, USEF local member Hunter/Jumper show, Pony Club Rally and Camp as well as WEC Combined Tests held on our grounds. WEC owner, Bobbie Wier has had more than 20 years experience in horse care management at Wisconsin Equestrian Center. Her staff is knowledgeable, caring and friendly. WEC boarded horses are treated with respect, consistency and kindness…and it shows.